Payments business PayPal has been hit by “technical issues” in the UK that have led to a string of transactions being sent for security checks. 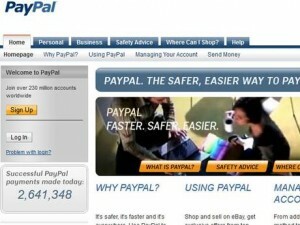 A spokesman for PayPal, which is used by people on eBay as well as other websites to transfer cash securely, said the business has been having “a few issues” over the last few weeks which have affected a small proportion of customers. Changes have been made to PayPal’s system to speed up the process when customers transfer money from their PayPal account into their bank account. They mean that customers are able to transfer funds to their regular bank account from their PayPal account within a few hours, a process which previously took three working days. But the volume of the quicker transactions has led to some hitches, meaning some transfers have been held for security checks rather than the money being quickly transferred. “We have had some technical issues which mean more transactions than usual are being reviewed for risk reasons,” the spokesman said. He said the underlying issues have been resolved and PayPal is working to clear up the problems by the end of the week. The spokesman declined to put a figure on how many people were thought to be affected but said it was a “minority” of customers. PayPal, which is owned by eBay, had 113.2 million active accounts at the end of the second quarter of the year, up 13% from a year ago.